First let’s review what is so special about this picture. If you are an American you should love your country and cherish your flag. I certainly do and when you park a beautiful car under the flag, I am in deep love. I have a Mopar and it’s a 69 Road Runner. 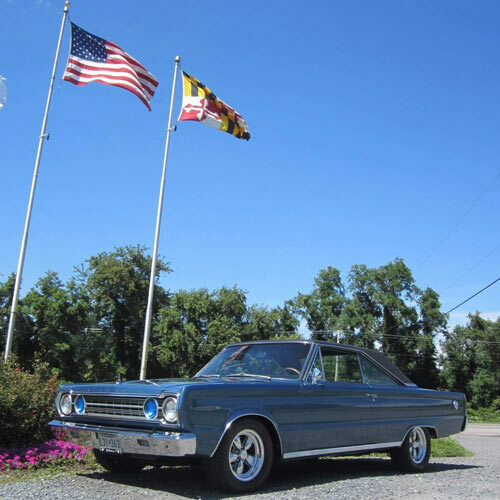 It is a great old school car that drives and behaves like a ’69 Mopar did. But, I always and I mean always wanted a GTX or a Dodge Coronet with a 440 and a 727 transmission. I drove one when I was a young guy and was hooked. I love the long hood, big fenders, huge trunk, and most of all that very hot 440 engine. So, why don’t I have one? Well, I am a idiot of course because my first love was a Mustang. So, I bought that. My second love was and is an old Chevy Truck called the AD. Advanced Design is what they were named for the ’49 to ’53 Chevrolet and GMC trucks. I got that bug as a kid and never could shake it. So, when the opportunity arose I acquired a 49 Chevy Truck. Okay, still room for more so I came across a deal on a ’69 Road Runner. The RR was my high school must have car because the jocks and such had them and they were fast and cool. But, in high school I was a lowly poor boy working part time gigs to survive. Hence, no RR then but I managed to find the car I could not afford then but could now, so I bought it. Still no GTX however. Then, I bought a 1928 Ford Model A. Why? Well, my Dad had one out of high school and he loved that black car with the red wheels. He spoke lovingly about that car and I always hoped I could buy one and give it to him as a present. He passed away before I could do so but I bought one that is black with red wheels in his honor. It is in the final stages of restoration and I will proudly drive it this summer in his honor. Still, no GTX. I was ready for one more car for my collection and I studied tons of cars. I looked at rat rods, hot rods, jalopy’s, and everything in between. I looked at a Dodge Daytona and at a Superbird but both were way out of my reach. So, I had a Mopar, one Mustang, an old 49 Truck, and a Model A. Now what? I need the GTX badly but I also at this time need some creature comforts. So, after much soul searching I bought a 2013 Shelby Cobra. A supercharged 5.8 liter engine that is scary fast. And I mean scary fast. So, in my collection I have cars and trucks I always wanted but no GTX. So, what’s a grown man to do? I think I am at some point going to sacrifice my 2005 Mustang GT and some cash to buy the GTX or the Coronet. It must have the 440 or the 426 hemi and it must have the 727 transmission. Once I get this accomplished I am going to stop collecting for a while and just start driving them. I am looking for a building that I can convert into a car storage facility for my cars during the winter as well. I want them all under one roof and secure. I tend to take things in steps but now I am a bit angry with myself that the one car I always loved is not in my collection. I will get there in time but I will find an original one that has been refreshed and at some point make it mine. As you noticed I have the big three car companies covered pretty well and that was always my plan. The moral here is to keep your eye on the goal, no matter how long it takes. It’s possible, it just takes a bit of time. ← Previous Story Should I Invest In This Hot Rod Build?